The Easter bunny has come to town. Woot! Woot! OK, can we just agree that Easter is the best holiday? Second only to National Root Beer Float Day, perhaps. And Lola’s birthday, of course. And the day the dollar store restocks. That is, indeed, a truly a extraordinary day. The best part about Easter hoopla has got to be Easter baskets. Chocolate. Chickens. Glittering Eggs. Toys. Socks. Did your mother put socks in your Easter basket? One time someone gave me a basket with teal blue press-on fingernails. Another time I gave someone an Easter basket with a bottle of Jack Daniels dressed as a bunny. Get it? It was a Jack Rabbit. Haha. OK, OK, OK, it seemed funnier when I was 23. I guess everything seems funny when you’re 23. Then again, hard liquor dressed as a small furry animal is always going to be pretty friggin nifty. Must give credit where credit is due, I got the idea for these baskets from these other baskets at World Market. 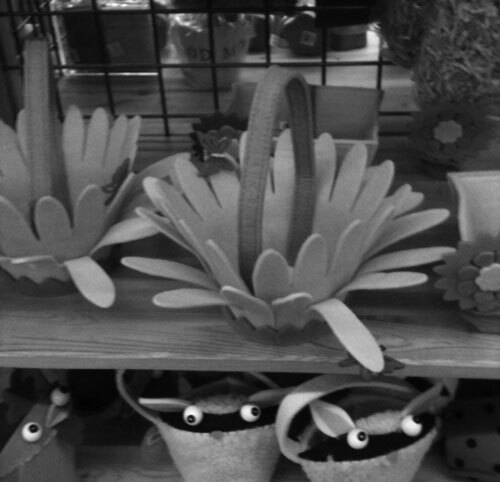 Their baskets look sort of like large felt daisies. Very cute. Decided that instant I was going to make something similar, but, as much as I like them, something about felt feels very wintery to me, so I used coffee filters instead. Guess I use coffee filters for everything. 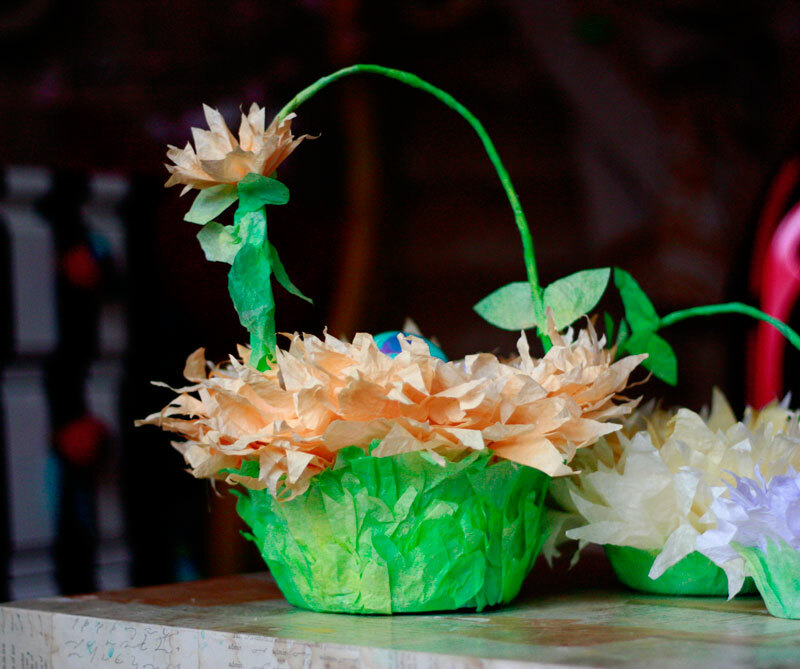 Someone less lazy than me should try making these from fabric or junk mail or something. Post it and let me know how it works out. 1 disposable bowl. Paper cups and tupperware containers work great too. 10″ plastic coated electronic chord (mine came from my old telephone….I’ll bet you have something laying around the house that will get the job done! 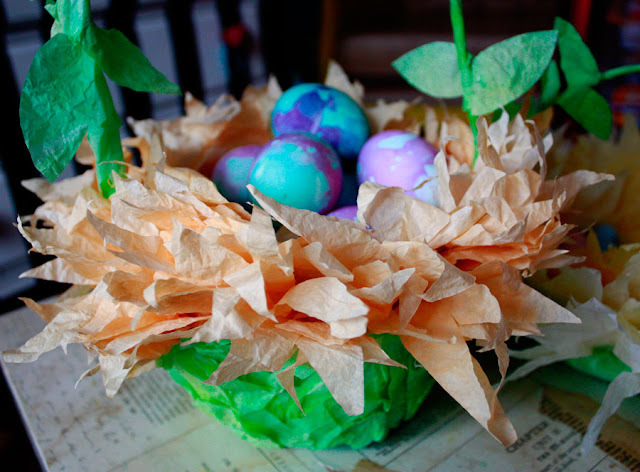 * You can dye coffee filters many ways. If you can dye eggs, you can dye coffee filters the same way. You can also just dunk them in a bowl that is 1 part acrylic paint to 9 parts water. Or use markers. Decide fir yourself. Quantity will vary, depending on the size of the base container. **You can swap hot glue for white glue and use clothespins to clamp in place as it dries, but hot glue is easier. I’ll do a kid-friendly version of this without hot glue on Wednesday. Stay tuned. 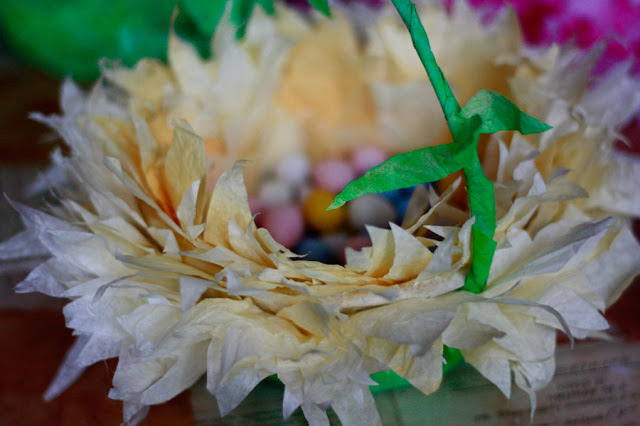 Use two coffee filters to cover the edges of the bowl, then fold and snip jagged edges along the rim of any remaining filters, similar to cutting snowflakes. I like to cute 3-5 filters at a time. Separate filters and pinch them them individually, forming loose fan shapes. Use hot glue to adhere to the inner rim of the bowl. After completing the inner rim of the bowl, flip your bowl and repeat along the outer rim. 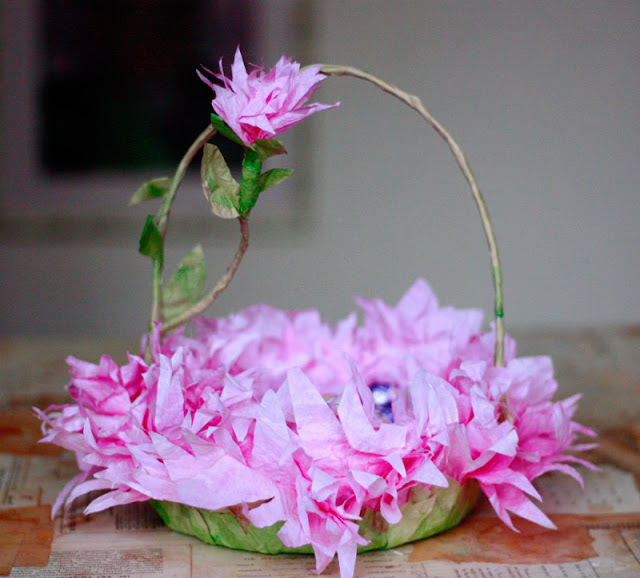 Tip: avoid crushing the petals by flipping the bowl onto a large soup can. 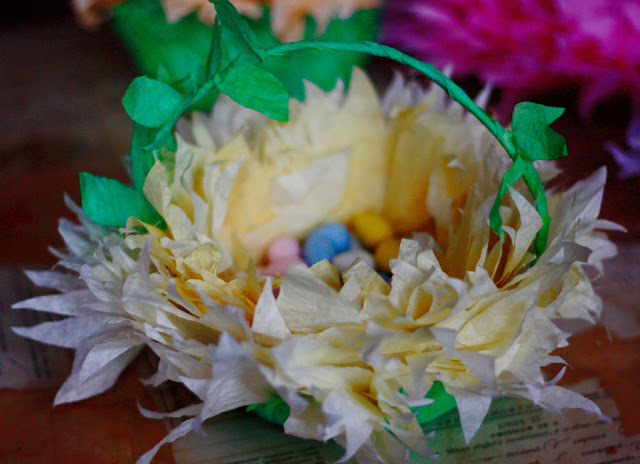 Use one of the green coffee filters to cover the bottom of the bowl, forming the base of the flower. Cut the remaining green filters into 1″ strips and adhere to the telephone chord. Tuck in some leaves or just for fun. Place one large yellow filter in the bottom and fill it with candy. Ta Da! You are ready to go! You could also add a little accent flower if you like. Makes it seem slightly less Easter-ish. Like something you could keep out on your cadenza all year round to gather mail. Man, penny saver coupons never looked so good! Or be traditional and fill it with eggs. Not as snazzy as chocolate and Jack Daniels but I give you props for being all traditional and stuff. 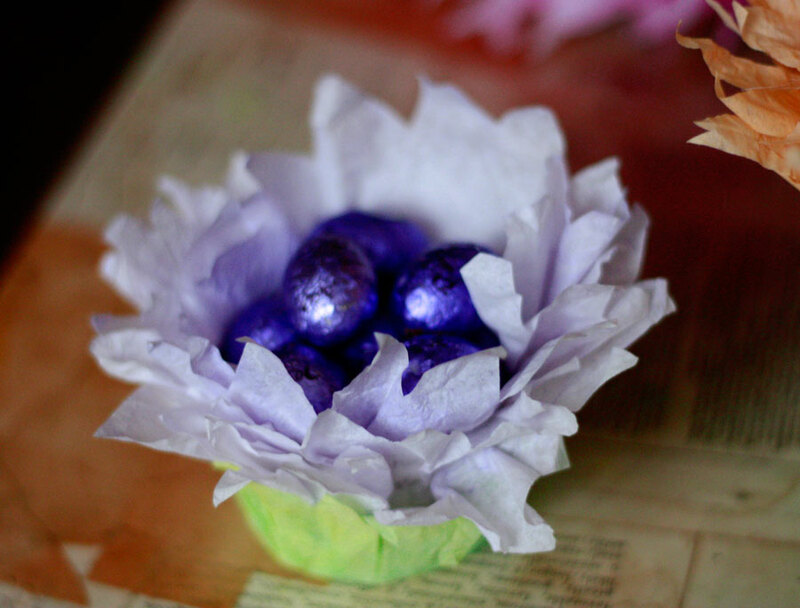 Come back on Wednesday and I’ll show you an easy, kid-friendly way to make a little tiny Easter basket like this purple one here. It’s so cute, you’ll want to eat your hand. I dyed coffee filters with food coloring for some flowers I made last year. And I used watercolors on some, too. HI, thought I would stop by and see what you were up to…Adorable!!! Of course my favorite is the pink, I bet a lot of people are using this cute idea! 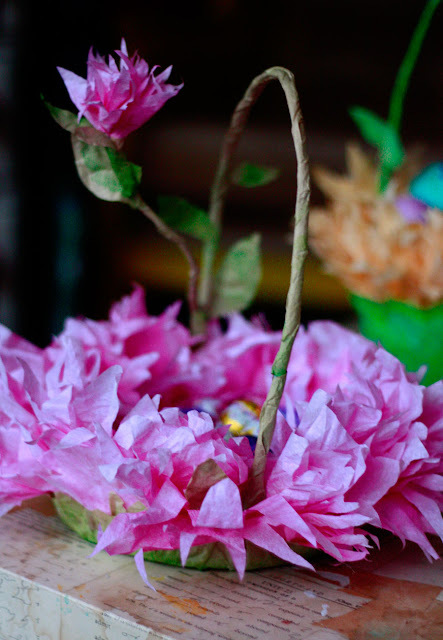 Super cute is everything on your blog you are a Crafty Diva! I just discovered coffee filters(obviously!!!!) 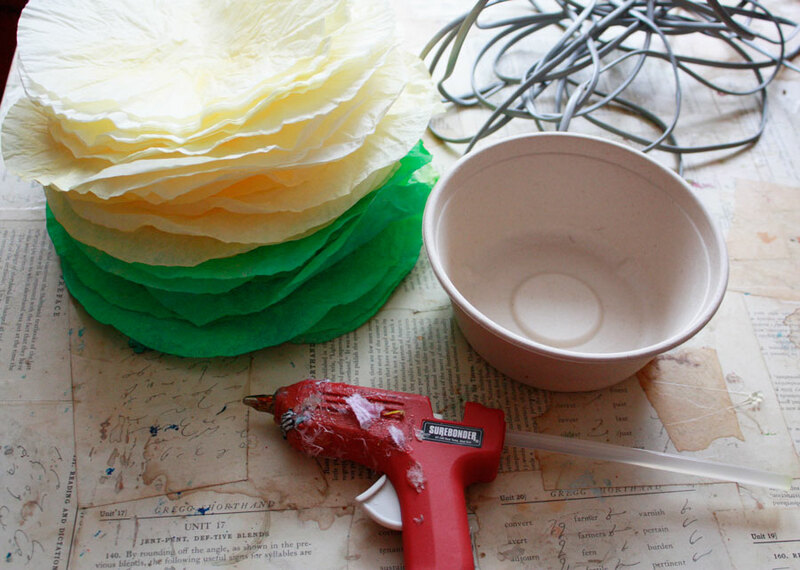 work great for paper mache! If I only had dyed the filters first I would be done with my eggs already. Now I must make a coffee filter basket with c.f. flowers and c.f.eggs. I love that they come out looking like one single huge, bold flower. The kind the sleepyhead munchkins woke up in! ah! miracle of miracles, now i am inspired about how to use all those plant containers i’ve nested into a tower after this spring’s planting. my mother will be so tickled. she loves easter so much. That’s better than any easter basket I had as a kid! old sewing patterns would work, too. great post! really cute idea- I love coffee filter projects! How lovely and creative! My girls would love to make these! also, featured these on my friday post today. LOVE These! I thought these were peony flowers at first! (from the small pic) These are great!!!! GORGEOUS! Want to make them! I happened to come across this and love this idea. 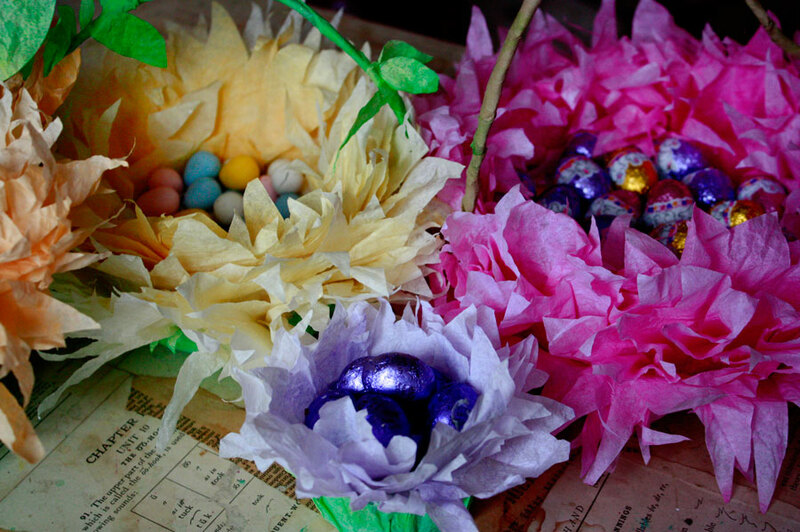 Now, I have a year to make it for next Easter. I will try the fabric and get back to you! I am a coffee filter fan a well! I just saw this looking for a spring project to do. I have used chalk on my coffee filters. It gives them that pastel look for spring. I’m loving all your ideas. What could be easier and prettier. Thanks for the ideas on how to color the filters. Maybe I’ll go to Family $ (close by) to see what they have. Our closest $tree is too far and no gas, doggone it. Living out in rural area is so nice but makes it harder when gas goes up so much. Happy Easter, great ideas and crafting. Just found you today! What a great idea. Love the fact that you had a picture of your inspiration. OMG you are GENIUS! I very much dislike EASTER GRASS! this year we made hanging poms and was wondering if there was anything similar i could do for the girls that wouldn’t make a mess! this is perfect thankyou sooo much! wonderful idea! totally doing this! I should write a post on this –I think everyone hates Easter grass, no? It’s pretty but it’s a mess. And dangerous if you have babies or critters. Thanks for the idea!